Lake Sentani is one of biggest lake in Papua Island which has exotic panorama. To develop Lake Sentani's tourism, there's an annual event called Lake Sentani Festival. This tourism development aims to tell about nature and culture of Lake Sentani area. 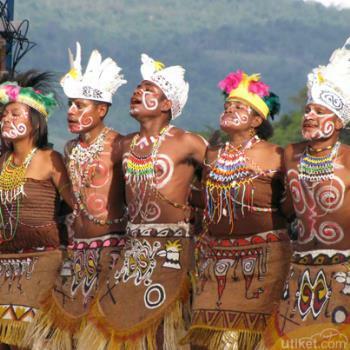 Lake Sentani Festival is usually held in Lake Sentani area. This festival firstly held on June 19th,2008 for five days in a row. Since that time until present, Lake Sentani Festival has been becoming annual schedule which started in every June 19th. 1. Culture performances: performs some culture attractions, such as rowing race, curly hair weaving, sago making traditionally, traditional dances and traditional ceremonies. Visitors can also taste of typical foods of Papua, such as sago porridge of Papua's typical foods which is called as papeda, bagea (sago cakes) and sirih pinang which become Papuan's favorites. 2. Papua's art exhibition: exhibits many kind of Papua's arts and crafts such as batik of Papua and noken. Noken is made from bark fiber. 3. Sightseeing tour: you can follow to enjoy Lake Sentani Tour, Sentani City Tour and canal tour. Lake Sentani's participants are dominated by residents of Jayapura Regency and Jayapura City. Another participants come from another regions of Papua or even outside Papua Island. Tourists who come to see Lake Sentani Festival, both domestic and international tourists increase year by year. Lake Sentani Festival has been becoming one of national pride's tourism event and one of wonderful Indonesia, especially wonderful Sentani.